The park has 38 hectares of mature Douglas fir, larch and spruce trees that provide habitat for woodpeckers and other cavity nesting bird species. White-tailed deer are often seen in the park. Located 5 km west of Rock Creek on Highway #3. The closest communities, towns and cities are Rock Creek, Bridesville and Osoyoos. Take 15 minutes to hike a short loop along the creek and out to three different benches that offer views of the rugged terrain of ravines and gorges that surrounds this little park. There are steep cliffs beyond the benches, do not hike beyond the viewpoints. For your own safety and the preservation of the park, obey posted signs and keep to designated trails. Shortcutting trails destroys plant life and soil structure. There are no viewing platforms but there are three benches that offer fantastic views of the surrounding area. Douglas fir, larch and spruce trees provide habitat for woodpeckers and other cavity nesting bird species. White-tailed deer are often seen in the park. This park offers a quiet, forested campground with 16 vehicle-accessible campsites that are all available on a first-come, first-served basis. 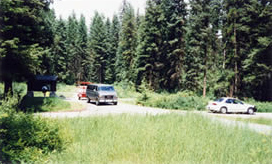 The campground was recently rebuilt and offers large, shaded sites. Campsites are often available for last-minute campers in peak months. Fees are cash only and are self-registration.